Tin Cup Designs Handwrought Jewelry: How do you know you're buying my jewelry? How do you know you're buying my jewelry? Does that seem like a silly question? Well, it just occurred to me that I haven't shown you my logo, so you wouldn't know what to look for when you visit one of the galleries or shops that support me. Of course, you could just ask, and they'll take you right to my things. 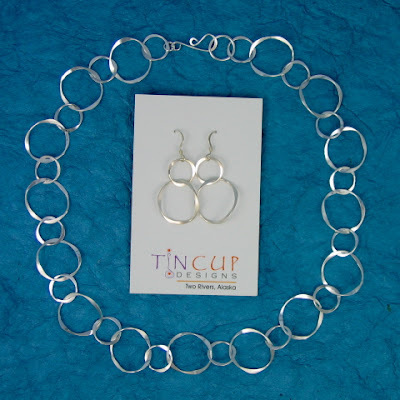 But in case you're shy, here's a photo of my Ruffles chain and the matching earrings — on the Tin Cup Designs card. At the moment, I have an experimental "booth" set up at Bonanzle. I've only posted four items: two chains and two pairs of earrings. I'd like to hear your reaction to the site: Is it easy to use? Is it appealing? Would you actually buy something from there? One feature I do like is that customers can chat with me while browsing if I'm on the site or leave comments I'll see immediately if I'm not. The idea of having a conversation with you is appealing. I'm also planning on setting up shop on Etsy and Artfire. I'll let you know when I do, as I'll want feedback then, too. I feel a little like Goldilocks: I need to try them on to see which site is "just right" for me and for you. I do want to emphasize that I have no intention of allowing my on-line sales to overshadow my galleries and shops. They will continue to be my primary outlet, and in these tough times, I want to do everything I can to promote and support them. Please help keep the arts community alive and vibrant by visiting the galleries where you live. Your jewelry set is looking so beautiful... Thanks for sharing the information about buying them! !